For those of you who follow tropical weather, it should come as no surprise that last year’s hurricane season can be described as a total “dud.” In fact, statistically speaking, it was the least active non-El Niño season in recorded history. This resulted in minimal impacts for the nation as a whole. Aside from the season’s first named storm, Andrea, no other system had a direct impact as a tropical entity on the United States. Looking ahead, the main question is will we luck out for yet another year, or will this season prove to be more destructive? Fortunately for those East Coast residents looking for some good news, the 2014 Atlantic Hurricane Season looks to feature another year of suppressed activity. Considering landfall probability is directly tied to the abundance of storms in a given year, the potential for a direct hurricane strike will also be much lower than would otherwise be expected. With that being said, however, remember that it only takes one storm to provide lasting impacts on a specific community. As such, it is always important to be prepared, even in the case of a below normal seasonal forecast. The modern era (1995 to present-day) has largely been characterized by higher than normal tropical activity compared to the previous period. The reason for this is that the phase of a global index known as the Atlantic Multi-decadal Oscillation (AMO) has been in its positive (or warm) phase over that period of time. For those of you unfamiliar with this index, the AMO is strongly tied to movement, propagation, and overturning of ocean currents across the North Atlantic Basin. When the AMO is positive, equatorial ocean currents have an easier time transporting warm waters from the tropics into the mid-latitudes. This typically results in an overall abundance of above normal ocean temperatures and therefore promotes increased tropical activity. With that being said, the phase of the AMO has trended downward beginning earlier this winter and has now dropped into its negative phase – where it is expected to stay through at least the first part of the summer. With this being the case, the rules mentioned above do not apply to this year – and as a result, we will likely see a better likelihood of suppressed activity when compared to average. For those of you who follow our long-range blogs closely, you will most likely recall that for the majority of this past winter season, the state of the North Atlantic Oscillation (NAO) was in a persistently positive phase. Aside from a lack of blocking and the development of an anomalous area of low pressure south of Greenland (which has effects on sensible weather across the US), a + NAO phase also has other implications across the entire northern hemisphere – including the tropical Atlantic. One of these is tied to the development of a stronger than normal area of high pressure off the Northern African Coast. In turn, this stronger area of high pressure promotes increased wind shear across the main development region of the Atlantic Ocean. Additionally, this pattern is also tied to increased upwelling, which allows colder deep-ocean water to mix to the surface. Both these factors are historically correlated to decreased tropical activity in the subsequent summer and fall, and therefore play a big part in why we think the upcoming season will be relatively inactive. 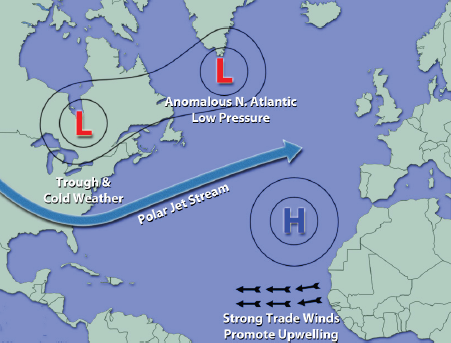 An idealized schematic of this past winter's pattern is included above for reference. Another index that will likely have a say in what ends up transpiring this hurricane season is the expected development of El Niño. After being cooler than average for the better part of the winter, sea surface temperatures across the equatorial Pacific have already risen above normal, which is likely a precursor to the development of El Niño conditions. Recall that this oscillation is commonly associated with cooler than normal ocean waters and enhanced wind shear across the Atlantic Basin – often resulting in below normal tropical activity. It is looking likely that El Niño conditions will fully develop either later this summer or early in the autumn and act to curtail activity for the peak months and latter half of the season. This adds further confidence to a forecast of below normal activity. Taking the above mentioned parameters into account, the overall tropical cyclone forecast for 2014 has been included above. Look for a total of 6 – 10 named storms to develop, of which 3 – 5 are expected to become hurricanes, and 1 – 2 could reach major hurricane status (Category 3 or higher, winds of 111+ mph). 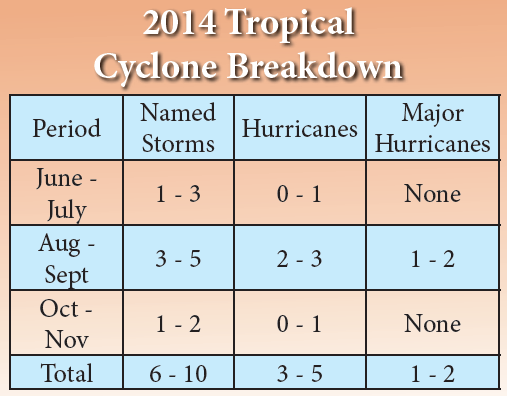 Note that this is below the long-term climatology of 11 storms, 6 hurricanes, and 2 major hurricanes. 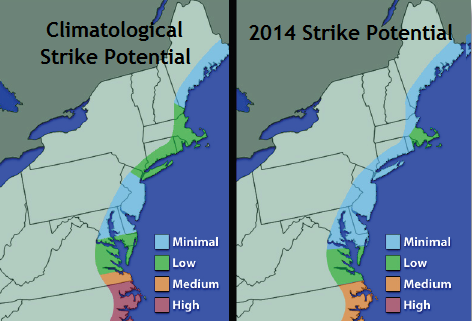 As alluded to previously, the overall lack of activity will likely result in fewer chances for direct coastal impacts (see below). Although significant impacts are not unheard of during El Niño events, the vast majority of landfalls during our analog or scenario year database shows most of these systems tend to strike either the central Gulf of Mexico or the Southeast Coast. Further north, landfall potential is expected to be minimal or low for all areas north of the North Carolina / Virginia border…which is also below average compared to climatology. 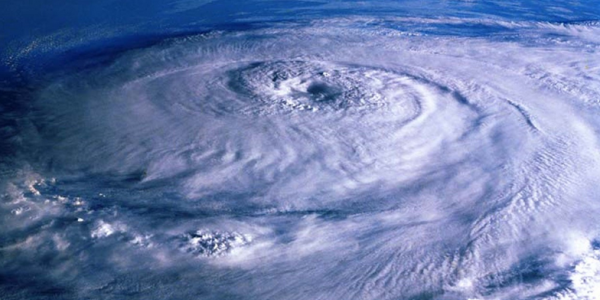 Lead high-resolution hurricane image courtesy of NOAA.